This Sugar Love Boutique blazer and this J.Crew Factory sweater have been on repeat for the last 2 weeks. I love both of these pieces. This is currently my favorite blazer that I own. You can't go wrong with elbow patches and stripes... And I could live in my hunter boots (even if it is not raining). I am sure you all must be sick of seeing this ILY Couture tassel necklace. But I don't think I will ever get sick of wearing it. It is my go to necklace. If all else fails I know I can add this to any outfit and it will look amazing. It is such a great piece for layering which is what I usually do. ILY Couture is currently having their friends and family sale. You can get up to $30 off, which is a huge savings. ILY Couture is my favorite place to go to get amazing jewelry at really great prices and quality. I have had my tassel necklace for over 6 months and worn it almost everyday and it is still in perfect shape! Use the codes below at checkout! Happy Shopping! Here are some of the pieces that I am currently craving and might just have to get now that they are on sale. Totally loving the elbow patches of your blazer! love the hot pink and stripes mix. I love that blazer! So pretty! I'm going to have to check out ILY Couture's sale! I am loving that blazer!! So cute!! Your hair looks so good straight! Love the black and white stripes with the pop of red from the elbow patches! This is such a cute outfit!! I love the stripes and those Hunters are adorable! I do like seeing you wearing your Wellies you look really yummy. LOVE your hair straight like that!! i think mostly because it's just different since your hair is usually so cute and curly but the straight looks amazing! 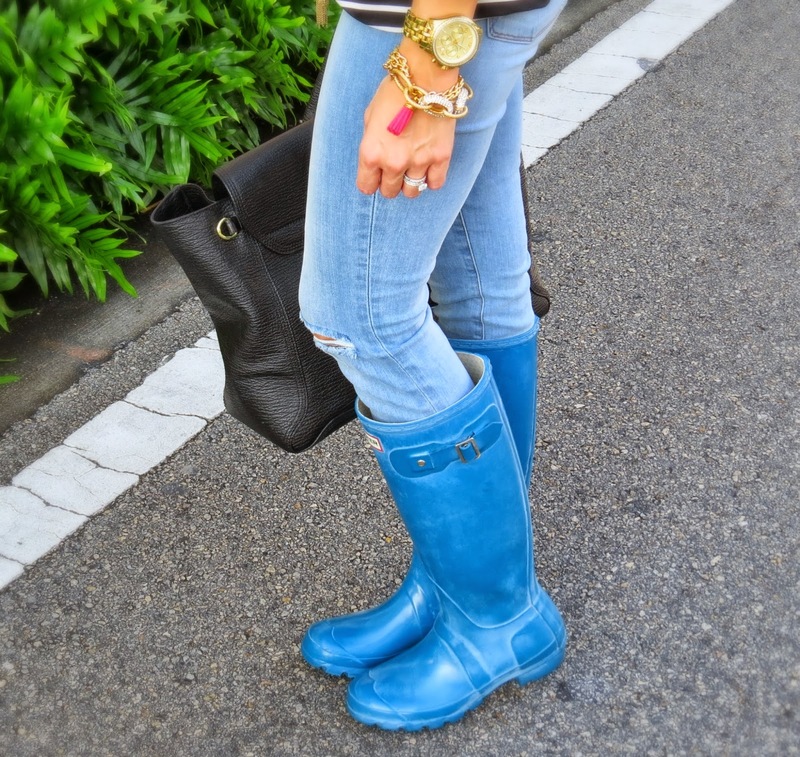 I can't get enough of your bright blue Hunters Jade... too cute! Love the blue hunter's I dont think I've ever seen that color! Love the necklace! Don't think I'd get tired of wearing it either.